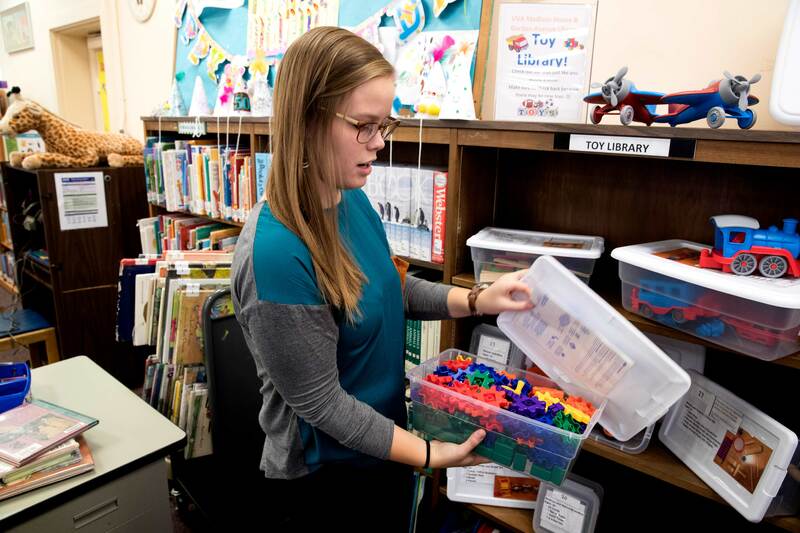 A special shelf at Gordon Avenue Public Library holds not books, but toys that children can check out, as part of a new program from Madison House, the University of Virginia’s student volunteer center. With Charlottesville’s first toy library, 2- to 12-year-olds can experience the joy of new toys all year round – everything from blocks to brain games. Playing with toys helps grow children’s imaginations and supports areas of development, including physical coordination and social interaction, said UVA third-year student Madison Lewis, the program director, and Gordon Avenue librarian Glynis Welte, who promotes the toys during other library activities. Lewis, who’s majoring in the Curry School of Education’s five-year elementary education master’s program while majoring in youth and social innovation, leads 10 volunteers who first prepared the toys and games for lending and regularly keep them cleaned. A longtime babysitter, Lewis said she loves kids and wanted to offer a wide range of items for them. Since he was already working with Madison House’s Housing Improvement Program, for which he’s the program director this year, he proposed the idea to Lewis. They got funding from Student Council’s Public Service Programming Board to purchase a wide variety of toys and games, and turned to Madison House to recruit volunteers and to ensure the program would be sustainable, Lewis said. The volunteers repackaged each item in a plastic box that has a picture of the toy or game and a list of all its pieces to ensure it all comes back after being checked out for three weeks. When toys come back, the volunteers clean them before they go back on the shelf for another child. About half of the toys are displayed on the library shelf and rotated with another batch every two weeks “to keep up the excitement” for the children, Lewis said. She and Welte have noticed that the toy library is popular with international families, giving them another way to become familiar with American culture, Lewis said. One simple task that makes the toy library possible, Welte added, “is the time the volunteers spend at Madison House cleaning the toys after each use. Without their time volunteering, we would not be able to provide the toys, because the cleaning would be too time-consuming for library staff. The projects she’s referring to take place during the library’s biweekly “Creation Station,” when Welte sets up arts and crafts activities, aided by Madison House volunteer helpers. Earlier in December, several UVA students dropped in to work with children from nearby Venable Elementary School’s after-school program as they made brightly colored snowflakes out of chenille stems and beads. Lajja Patel, a third-year biology major, and Darya Tahan, a second-year student, said they enjoy working with the kids on these creative projects as a break from their science-heavy coursework. During that activity, as well as the library’s story-time sessions, Welte frequently mentions the toy library or shows toys that go with the books that she’s reading to children. Two examples she gave were recommending “Astronaut Handbook,” by Meghan McCarthy, when a family checked out an astronaut and space shuttle set, and the book “Dig Dig Digging” to go with construction vehicles. “The books provide vocabulary and topics to enhance the play experience and [playing] makes the words and information meaningful,” Welte said. The toy library is part of Madison House’s Youth Mentoring network, which includes a Big Brothers and Big Sisters program and Bridging the Gap, a program devoted to refugee children. These volunteers also use the toy library when they take the children they work with to Gordon Avenue Library.